View the Photo Gallery – click once on the images in the Photo Gallery to enlarge them. Please note that these images and captions are designed to display on a desktop or laptop computer for maximum effect; they may not display in the same way on a tablet or mobile. Several of these photographs were used by BBC Wildlife Magazine in April 2017 to illustrate a feature on GERALD DURRELL. Even as a very small boy I was utterly fascinated by animals of every kind. My grandmother, who lived next door to us in Downend, Bristol, sometimes entertained me by raking out snails from between the stones of her garden rockery so that I could watch them glide back to their hiding places at top snail speed. I remember the occasion when I was out walking in the countryside with my parents and my father found a blackbirds’ nest in a bramble bush, with the female bird sitting tightly on the nest even though we were so close. I was entranced by such simple contact with nature, and experiences such as these were of enormous interest and gave me huge pleasure. Another experience that lives with me to this day happened when I was in my mid teens. I had been visiting Bristol Zoo quite frequently and gradually became friends with the reptile keeper, Alf Elliott. One day Alf invited me into the central service area of the zoo’s reptile house. He then opened the top of one of the snake cages, leaned in and picked up a small royal python which he placed in my open hands for me to hold. I shall never forget the thrill of that moment – pure, undiluted delight – and the royal python as a species has had a special place in my heart ever since. For around three years after this I spent my Easter and summer school holidays working in that same reptile house with Alf and gained a lot of valuable experience in the care of exotic reptiles and amphibians. 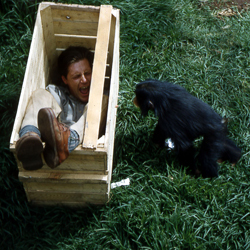 The fact that the zoo paid me ten shillings a day to do this work was just an amazing bonus! During my mid to late teens, when I was working for my GCE ‘O’ and ‘A’ levels at Chipping Sodbury Grammar School, in Gloucestershire, I wrote to many of the great and the good involved in the world of natural history, wildlife and zoology, particularly those who wrote books or appeared on television. One of those people was Gerald Durrell, who had already written several books about his animal collecting expeditions to various parts of the world. Durrell brought back animals from these trips and sold them to zoos, something that is now seen as unacceptable and unnecessary. To my surprise, Durrell replied showing obvious interest. Soon after this, in the summer of 1956, he and his then wife Jacquie met me and my parents at my aunt’s house in Salisbury. Durrell then decided that he did indeed want me to accompany him on his next animal collecting expedition, to what was then the British Cameroons in West Africa. 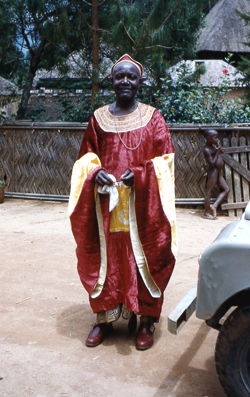 He said he placed particular value on my knowledge of reptiles and amphibians as the Bafut area of the Cameroons, where we were to be based, was rich in these animals and he wanted to bring back as wide a range of species as possible. Gerry, Jacquie, Sophie (Durrell’s secretary) and I left for West Africa on a Fyffes banana boat shortly before my nineteenth birthday in December 1956. During this trip Durrell made a very significant decision – that he no longer wanted to pass his animals on to zoos on his return to the UK but instead wanted to set up a conservation-linked zoo of his own. Indeed, soon after he returned from our trip he established Jersey Zoo which, together with the Durrell Wildlife Conservation Trust, has become well known and respected for its strong association with wildlife conservation and education. Our trip to Cameroon, which lasted around six months, is the subject of Durrell’s book ‘A Zoo in my Luggage’, published in 1960 by Rupert Hart-Davis. I am Durrell’s ‘young assistant Bob’ in the book. To view some of the photographs taken during this trip click on ‘View the Photo Gallery’ on this page. They were all taken in 1957 while we were in Cameroon and were selected to convey a general impression of events rather than focus on the animals. For links to nearly three hundred images of West African animals, including gorillas, other mammals, birds, reptiles and amphibians, click on ‘Zoological Garden, University of Ibadan’ at the top of this page . Several of the photographs in this Photo Gallery (see link below) were used in April 2017 by BBC Wildlife Magazine to illustrate their feature article on Gerald Durrell and his lasting legacy. View the Photo Gallery – click once on the images in the Photo Gallery to enlarge them.